Manaf Tlas, a Syrian general from a powerful family close to President Bashar al-Assad, has defected and is on his way to Paris, French Foreign Minister Laurent Fabius has said. Laurent Fabius described it as a “hard blow for the regime” that showed Bashar al-Assad’s entourage was beginning to realise the regime was unsustainable. Brig. Gen. Manaf Tlas fled Syria via Turkey, his family confirmed. If confirmed, it would be the highest-level defection since the unrest began. Pro-government website Syriasteps said earlier Gen. Manaf Tlas had made an “escape”, adding the move was “insignificant”. Earlier rumors about his possible defection in March proved to be false. “[Bashar al- Assad’s] close entourage is beginning to understand that the regime is unsustainable,” he added. His father, former Defence Minister Mustafa Tlas, is reportedly living in France. Brig. Gen. Manaf Tlas’s intentions may only become clear if and when he appears in public to outline his plans. Amer al-Sadeq, a member of a Damascus-based opposition group, described the latest development as “a good sign”. “Defecting soldiers, we see many of them, defecting officers, the more they come the better it is to make the regime weaker,” said Amer al-Sadeq. Brig. Gen. Manaf Tlas, believed to be in his mid-40s, is a commander of a unit of the elite Republican Guard. 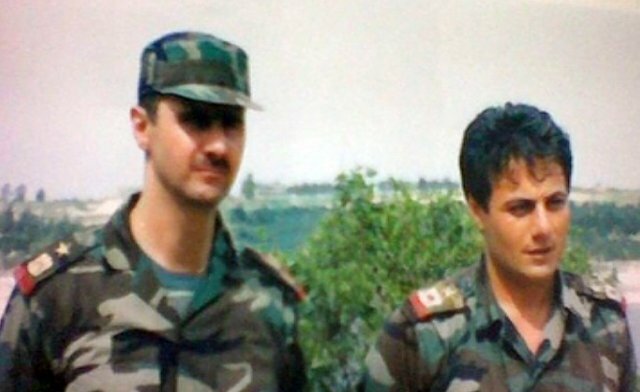 As a young man he attended military training with President Bashar al-Assad. Gen. Manaf Tlas has been under a form of home arrest since May 2011 because he opposed the security solution that the regime has been implementing, sources say. He also was the first government official to meet the opposition back last year to try to start a dialogue and find a political solution to the 16-month crisis. Unlike most of Syria’s Alawite leaders, the son of former Defence Minister Mustafa Tlas is a Sunni Muslim. Syria’s majority Sunni community has been at the forefront of the revolt against the president and has borne the brunt of the state’s crackdown, which the UN estimates has left at least 10,000 people dead. For decades, the Tlas family has given support to the Assad family, helping to ensure Bashar al-Assad’s succession to the presidency 12 years ago. If Manaf Tlas’ permanent departure from Syria is confirmed, it would mark the first break of a member of President Bashar al-Assad’s close circle, correspondents say. Observers believe that the move may encourage other Sunni officers to consider their allegiances. Gen. Manaf Tlas’s departure comes as French President Francois Hollande is hosting a Paris Friends of Syria conference with representatives of more than 100 countries to try to find a way to end the violence in Syria. US Secretary of State Hillary Clinton urged the representatives to persuade Russia and China to end their support for the Syrian regime. “I ask you to reach out to Russia and China and to not only urge but demand that they get off the sidelines and begin to support the legitimate aspirations of the Syrian people,” she said. She also called on the UN Security Council to pass a resolution imposing immediate sanctions on Syria, including under Chapter 7 of the UN Charter, allowing for the possibility of military force. The Paris meeting follows similar events in Tunis and Istanbul which demanded tougher action against the Assad regime. Russia and China, which both hold vetoes in the Security Council, are not at the meeting. UN diplomats are working on a document calling for restrictions on commercial activity if Mr Assad fails to abide by UN and Arab League envoy Kofi Annan’s ceasefire plan and roadmap for a political transition. The roadmap – announced last weekend by Annan after a meeting of world powers in Geneva – includes an interim government to enable the Syrian people to live ”independently and democratically”. The Western powers believe that Bashar al-Assad should play no part in Syria’s future, but the roadmap allows President Assad an effective veto over any interim candidate he opposes. Some 15,800 people have died in more than a year of violence in Syria, activists say.